I had the pleasure of creating this dimensional flying geese quilt with Collage, a brand new range of fabrics by SUCH Designs for Windham Fabrics. The fabric is scheduled to be released in July. Carrie Bloomston is the artist responsible for the impeccably designed fabrics I used in this quilt. I couldn't help but play with the rainbow-y graduation of colors when laying out the fabrics, they seem to beg for it. Aside from the vivid colors that this range offers, I truly loved the kernels of wisdom embedded on the 'newsprint' and 'scattered' prints. Who doesn't enjoy an uplifting, thought provoking quote? There are some goodies on here! You can read more about Carrie's inspiration for this line on her blog, get to know her! She's going to be around for awhile, she's a tried and true artist...I can't wait to see what else she's got up her smock sleeve. She's also got links to all of the other designers that were making some magic with this fabric....they are all having giveaways too! To celebrate the arrival of Collage, SUCH Designs and Windham fabrics are offering up a layer cake (10" squares) of the entire range. You don't have to wait until July to get sewing if you win one! Leave a comment below. Share your favorite quote, a crafty plan or your shoe size...whatever strikes your fancy. Just be sure that I can reach you via email if you win! Congrats to Barb! Random.org chose #153. Barb and Sharon of the blog Wits End. Does this mean you'll have to share the fabric? Uh oh. Perhaps you don't sew? Or want to double down on your chances of winning something? Head over to my Facebook page, where you might win one of the two coin purses shown above. Adapted from the Gathered Clutch Pattern by Anna Graham of Noodlehead. 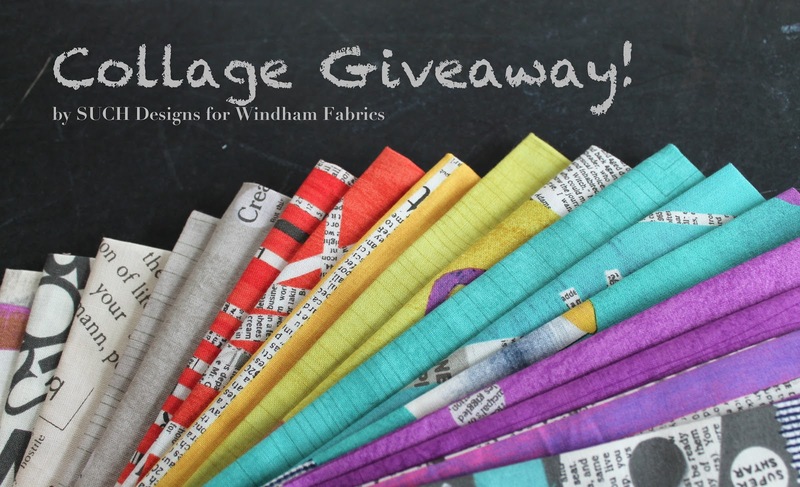 She's an amazing designer and she'll be showcasing Collage fabrics on her blog April 18th! 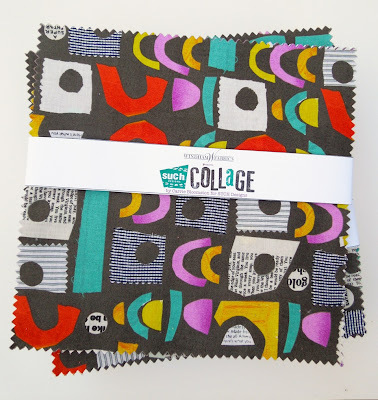 Collage should be available at your finer local quilt shops and favorite online retailer in July so be sure to ask if they'll be stocking this lovely line! Fabulous quilt - I love it! I'm giving up wine so I can tackle my mahoosive sewing "to do" list - that's dedication for you! Yay, free stuff! :P Uhmm, shoe size? Left one is a perfect 7, right one is a 7.5! Apparently it's perfectly normal to have different sized feet, but it's a real pain buying shoes. That is a lovely collection! My shoes size is a 7.5, sometimes 8! Beautiful collection. I love the text print fabric. I'm working on a Dresden Plate table topper and my shoes size is 6 LOLLL. Thanks for the chance to win. This is gorgeous fabric and your quilt looks stunning. My crafty plan is to try and get a bag made while I have no kitchen, dining room, builders crashing and banging and 3 children on school holidays! Realistic? I think not! Absolutely beautiful quilt! My goal this week is to start a new baby quilt for a new little niece due in August! My crafty plan is to make three pillow covers and a mini quilt by the end of this month. Not sure I can make it! MY shoe size is 9.5. I love this fabric and your quilt!! I wear an 8.5 usually...sometimes an 8. Love your quilt! This is beautiful! Would love to make something from this! What a cool fabric collection. I love the combination of text and rich bright colors! What a fun collection to get in advance to play with! Love your project. I'm looking forward to my semester ending in 5 weeks so I have time to sew again. What a funky, unique fabric collection! My craft plan is to learn to quilt. ha! I've been admiring the craft for long enough, and I think its high time I dive in. So if I were to win this giveaway, it would surely to kickstart my new hobby! Sweet! One of my favorite quotes: I may not have gone where I intended to go, but I have ended up where I needed to be. Lucky you to have such fun stuff to play with! All my crafty plans are for girl baby stuff :) But is there time enough to sew it all before she comes?! What a cool line of fabric! I have crafty plans of using up my scraps and making log cabin blocks this week. Such a beautiful quilt! I absolutely love the saturated colors of the new line. Thanks for the giveaway! This is interesting fabric - unusual and I think it will be fun to work with~! QBeautiful quilt! Thanks for the giveaway! I love the quilt and the fabric! So pretty. I can't wait for July those text prints look amazing and I love your rainbowy quilt! love the text print too! I love newspaper prints! And my shoesize is 41 :) As for the crafty plan? I'm on vacation so 3 weeks dedicated to sewing and handmade stuff, yayyyy! ooh. Would love to play with this new line! Love that collection! My plan for the year includes sewing with more precuts. Ohmyeffinggosh, I love this quilt!!!! You rocked this one. And on top of it, it's a killer fabric line. Love this on so many levels! P.S. My feet are size 10 and I'm getting two quilts ready to quilt this week. :-) I want those UFOs outta there! Such a fabulous new collection! Thanks for sharing - I love your quilt! Thanks for the chance to win! Cute quilt! My plan of attack is to finish quilting 3 large quilts. Thanks for the chance to win. ok...so i *was* a size 10 shoe size, and then I had 2 beautiful children...and now Im an 11. and i found my brand new roller blades, still in box, that i bought 11 years ago...size 10. pooh, just when i was ready to roll! your quilt is outstanding!!! I'm a size 9N... love this fabric line and those little bags are adorable! I'm an 8.5 or a 9! (super wide feet, though). Thanks for a chance to win! Great prize. I wear size 6.5 shoes. "It's not the size of the dog in the fight, it's the size of the fight in the dog". Wow! Such a fabulous quilt. And the collage fabric collection is amazing. I would love to start sewing with it! oooh! Love the quilt with the geese. I have some geese at home that I've been wondering how to assemble. Another great quilt! Your blog is very inspiring! Thanks for the giveaway. I want to make a picnic blanket with it! My crafty plan is to finish all those baby quilts for the coming babies on time. Thanks! and to know where online I will be able to purchase it. This would make an AWESOME quilt! I'm thinking triangles! My crafty plan for the week is to knock out all my block of the month blocks to get to work on other stuff. My favorite quote is," Fortune favors the bold." My shoe size is 8.5 narrow and my crafty doings this week is pillowcases for ConKerr cancer. Great fabric, thank you for sharing. My show size is a British size 4 1/2. Shoe size 39. Met Carrie Bloomston at a quilt show in Arizona. Delightful woman, great pattterns, love the fabric collection. "It takes a lot of work to figure out how to look so good.” That is my favorite Andy Warhol quote, and I would definitely consider it words of wisdom for quilting! 6-1/2N... It's a bear to find. Love your quilt and her new line of fabric. What wonderful fabric. And your quilt is beautiful too. I love fabric with text on it. My current favorite quotes is from the poet Mary Oliver: "Tell me, what is it you plan to do with your one wild and precious life?" My favorite quote is "Begin at the beginning and go on till you come to the end: then stop." This is my favorite quote and it has gotten me thru three deployments with my husband. "Distance is not for the fearful, it is for the bold. It's for those who are willing to spend a lot of time alone in exchange for a little time with the one they love. It's for those knowing a good thing when they see it, even if they don't see it nearly enough..."
And my shoe size is 8.5! lol Thanks for the chance to win! This fabric is to die for! LOVE IT!!! My favorite quote is from Christopher Robin to Winnie the Pooh: "You're braver than you believe, and stronger than you seem, and smarter than you think"
Oh what a fantastic line of fabric! Loving those text prints! I have been (impatiently) waiting for this line ... I love, love, love the newsprint, among others .... my shoe size is 8 1/2 ... my birthdate is a secret! Thanks for the opportunity! Winning fabric is the inspiration for the next project. I love how your geese pop out! My shoe size is a 9... or an 8.5 if i want to try to squeeze them in. Love the line!!! I'm into making Rag Quilts right now!!! Would love to make one with this line!!! Erica! I just wanted to let you know how much I love your quilt!! You are just sooo creative! I love how you made it from the gorgeous line and gifted the end result back to the designer Carrie. It's such a great way to give back love! 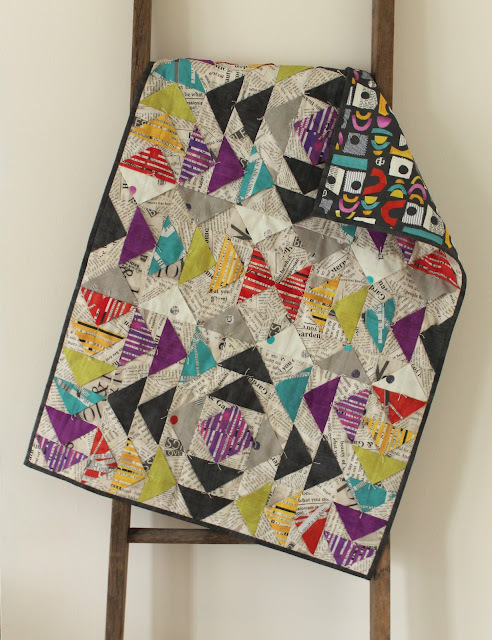 I love the dimensional geese quilt and the fabrics! Thanks for the chance to win this! That looks like an awesome collection, so fresh and beautiful. I love the fact that it has words on it. Quilting and books....two loves of my life! I have rather small feet, my shoe-size is only 5. I love your quilt. And I love quotes on fabrics. Lovely fabric and LOVE your quilt. Its a beauty. What a gorgeous pile of fabrics! Thanks. Your quilt is amazing. Fun fabrics! I'll be putting binding on a quilt this week! Thanks for the giveaway! :) Shoes? :) I prefer barefeet 365 days a year. These fabrics are fabulous! Perfect for millions of projects! shoe size 43! These are beautiful fabrics. "Winning isn't everything..." BUT IT WOULD MAKE ME JUMP FOR JOY!!! I can't wait to play with this fabric, whether I win it or purchase it. Love the newsprint look. This is posted above my desk: My favorite style of quilt is a finished one. 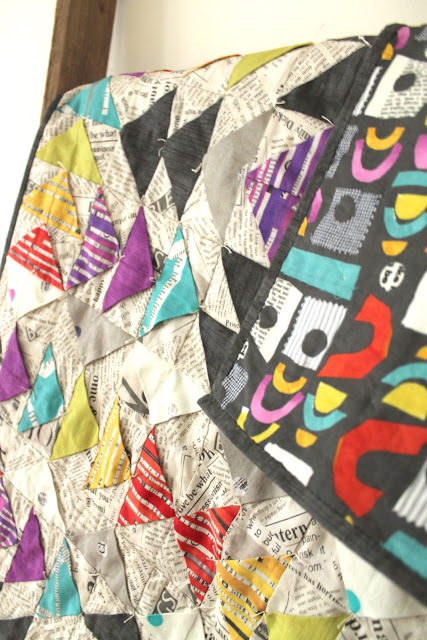 My friend shared your quilt on her blog, and I was coming over to say that quilt is so freaking awesome!!!!!!!!! And then there was a nice surprise to have found that there was a giveaway too??!! Thank you! This collection looks amazing. Off to explore your blog a little more. Thanks for the chance to win that amazing fabric! What a special collection. Can't wait to make something beautiful with it. I put a reminder in my calendar to start checking for it on June 25 so I won't forget. Thanks for the opportunity to win! Am I the only quilter on the planet who has never worked with a layer cake?!?!? I have so many crafty plans waiting for my attention. I have a quilt top hanging on my wall waiting for sandwiching and quilting and a new top cut and ready to sew tomorrow. Lovely fabric. great colors. My craft plan is to finish a large blanket I am knitting. I am not going to start anything else until that monster is finished. Thanks for the giveaway. Gorgeous quilt from a gorgeous fabric! My crafty plan this week is to finish some some UFOs. They're piling up too high! Wow, I love that fabric! And I love the coin purses ;) My shoe size is about 5.5. I can wear boy shoes to save money ;) Thanks for the chance to win! What great fabric, and I just love the quilt! I don't like to talk about shoe size because it is such a large number which my mother claims is due to the fact that she could never keep shoes on my feet, still don't like to where shoes. Love your quilt! Does your pattern make flying geese less fussy? Thanks for the giveaway. I love this fabric line & your quilt is amazing to say the least. My favourite quote is "Imagination is More Important than Knowledge" Albert Einstein. The fabric range is amazing. My plan this week is to finish quilting an 80"x 80"quilt and bind it...phew. wow - this line is so unique and fun. Came across this quote recently, "Follow your bliss." Beautiful quilt and I love the text fabrics! Beautiful quilt! I want it! I would lovelovelove to have some of these fabrics! I cannot wait until they're released. I'm loving Collage and what is being done with it .. ooh to get my hands on some ! Big ol' size 9's . What an absolutely stunning fabric collection! I haven't seen anything like it here in Canada. It would be so cool to work with it. My shoe size is a huge 9. I am said to say my shoe size is 11--on a good day. Wow, these fabrics are wonderful! My plan for the week is to finish the quilt for my great niece. Wonderful quilt and great fabric - thanks for the chance to win. "Do your best and leave the rest, Angels can do no more." I just love this line and glad it is not coming out until July so I can save my pennies. I want it all! Me encanta el diseño. Precioso. I love this line too! I am a newbie to all of you sewing bloggers and have become addicted to it! I have bought Ayumi's book too and plan to try and I mean try the sew along. I would love to win this to help inspire me! For some reason it gave me 'anonymous but my tag is golfingbev....Beverly. Still getting the hangof this. Great looking fabric...very eye catching and vivid. My plan is to finish the top of the scrappy quilt I'm working on. My left foot is a 7-1/2, while the right is a 7, very common I hear. WOW! (people exclaim when they see my size 10 feet!) But WOW! This line is awesome and I would love to win. The Collage speaks to me! love all the fabrics and what was made with them! love the text fabric in the background!!!! Oh my that fabric collection is divine! One of my favorite quotes is short and sweet...Carpe Diem. This fabric collection is divine! One of my favorite quotes is Carpe Diem. Thanks for the chance to win. OMG! The fabrics are awesome! And your quilt is beautiful! You always impress me every time you show a new quilt you've made. I hope you show how you made this quilt. I'd really love to know the technique you used to make those three-dimensional triangles. Are they like prairie points? Love, love, LOVE this line. I am saving my pennies until July...I want the whole line, I do. Oh. and my shoes are 8.5's! I am so smitten with this line that it keeps me awake at night! I love the 3-D quilt that you made -and think that a pinwheel along those lines would be splendid to create! Wow, I love this fabric. Simply amazing. And my shoe size can range from 9 to 10 depending on the brand. It's crazy! Thanks for the chance to win. Live, laugh, love with all your being:) I LOVE HST'S ! Your quilt is awesome, the fabrics are perfect in it :) I would be ecstatic if I won the layer cake!!! "Forget about the future, take hold of the moment"
I LOVE your Fabric!! wish i can win it and try to make the most beautiful blanket out of it! Still a beginner but your blog inspires me to believe in myself and not to hold back when inspiration over flows! What an awesome collection! I'm working on making lavender sachets out of quilting scraps this week! Omg, I love this collection! Cannot wait til it comes out. Love the everything about this fabric! My quote is ' it's only a failure if you don't try'. A quote from my mother. "It is better to have and not need than to need and not have." Works for fabric, kleenex, sweaters, lots of things! 5. UK 5, not a US 5. Not sure what the difference is. gorgeous fabric, thanks for the chance! 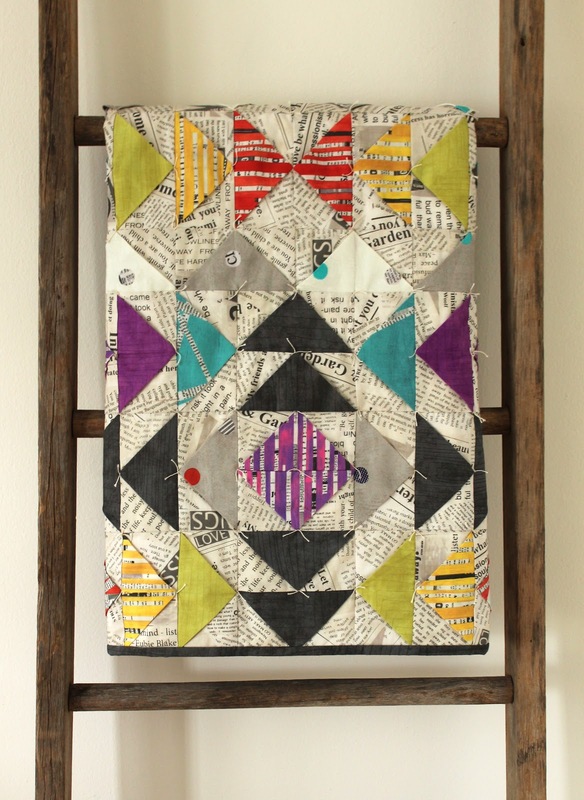 After seeing all the quilts on this blog, I'm itching to make one of them. Not only is the fabric great, but I love your work! I love the 2D flying geese very cool. I'm working on a log cabin made out of triangles. "love people more than they deserve." i heard that at a conference once, and it's stuck with me since. thanks for the giveaway! That line is incredible! I want to quilt with it ASAP!!!! :) Oh please send me this fabulous fabric! That fabric is exquisite! Thanks for sharing the offer. I have big feet 9 1/2. Just had half a bottle of champagne to celebrate my hubbie running his first marathon. He loves running . I love sewing. Oops giveaway over .too much champagne. Better luck next time. Very nice collections for the handmade handmade purse, its colorful stylish & gorgeous. That looks like an awesome collection, so fresh and beautiful.Used for handmade handmade purse ? Thanks for post. I'm sorry if this is my second comment about this, I couldn't tell if the one yesterday went through. I absolutely LOVE this quilt. It's so beautiful and you did such an amazing job! I was wondering if you have a pattern for it, or if you just whipped it up on your own. Either way, would you be willing to provide some yardage and cutting instructions? I would love to pay for this is possible, I REALLY want to make one similar. I hope this isn't offensive, I just love your work! Thanks very much!